​Let's help each other to live beautiful and prosperous lives, shall we? There are two sets of terms and conditions every vendor must abide by. The first is TGIF Bazaars' general terms and conditions, the second is additional terms and conditions set by the venue owners or events hosts. ... if unsure please check with us. 1 ) Singaporeans and PRs are welcome! 2) Foreigners with Visitor / TOURIST passes are not allowed to operate or help you at your booth at the Bazaar (due to restrictions of NEA & MOM Regulations), STRICTLY. 3 ) Work permit/ S pass/E pass holders, please note that your eligibility to book depends on your employer's contractual agreement with you. TGIF Bazaars shall not be held liable in the event the vendor is found to be violating any employment agreement with their employer or governed laws. 4) When booking, it is compulsory to fill up your full name, NRIC, Work Pass number or Business Registration number. Your personal particulars will be kept in strictest confidence. 2 ) The booking system will trigger a quotation for you. Please note that the booth quoted to you at this time is not confirmed. 3 ) Upon receiving proof of transaction, your booth will be secured. 4 ) Official receipts will be issued for all payments made. 5 ) The Organizer reserves the right to re-assign the booth to others if payment not received after several prompts. 1 ) No refund will be made for cancellation of booking. 2 ) You are allowed to change the date subject to 1 week 's notice before date of bazaar. 3 ) An admin fee of S$25 will be imposed for the any pull-outs or change of dates. Each change at $25. No Exception. 4 ) Should there be any concerns, please e-mail to sales@tgifbazaars.com. 1 ) This is a rain/shine event. Embrace and enjoy the challenge. 2 ) No refund shall be given for bad weather. 3 ) Vendors are advised to have their own plastic sheets to counter bad weather. 1 ) Unload of merchandise is allowed at the approved car parks provided or recommended by venue owners. 2) Unless provided by the venue which is usually NOT​ the case, parking fees are borne by merchants. You will only be allowed to sell the products that you have declared during submission of booking. The organizer reserves the right to request the vendor to withdraw any product not declared or informed. 1 ) Each booth cannot be shared by more than 2 merchants. 2) All merchants must keep to within the space allocated. 1) Unless the market is themed after luggage bag sales, no merchants can display their products messily inside a luggage bag. 2) All merchants are strongly encouraged to make their booth as attractive and as lively as possibly (because this will also help you attract attention of potential customers). 1) No smoking in any of our bazaars, by our policy and by law. 2) All merchants must dispose of their trash, waste, refuse from the booth into proper disposal areas such as rubbish bins. 1 ) You are liable to indemnify the Organiser or Venue Owners for any loss or caused to their property and / or injury to their employees arising out of your (including your employees, agents or representatives) negligence. Your Responsibility. Please read all 10 points. 1 ) You agree to accept Terms and conditions set by TGIF Bazaars, our Event Partners and the Venues we operate in. 2) The Venue Management team or TGIF Bazaars shall not be held responsible for any damages or losses of your items. 3 ) Be punctual for your bazaar operating time. If not, inform us. 4 ) Strictly only black cloth to be used to cover any merchandise stored overnight for any sheltered / indoors venue. 6 ) Inform or talk to us if you have any concerns. We are nice people. 8 ) Strictly no smoking in the tents. Damage: $50. 9 ) Unless the theme calls for it, only TGIF Bazaars Table cloth can be used to cover our tables provided. You are allowed to bring your additional table cloth to place over our table cloth if need be. Any other items brought for display purposes, do not cover TGIF Bazaars Logo located at the bottom right of our table cloth. 10) Overnight storage (with or without any night watchman) is at your own risk. 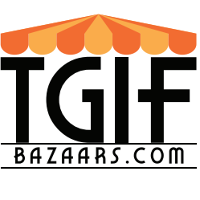 ​TGIF Bazaars reserves the right to make changes to booth allocation, prices, terms and conditions without prior notice, without explanation. All hardware provided by TGIF Bazaars LLP are on rental basis unless otherwise stated..
You will allow TGIF Bazaars and affiliates to use any images of your products, yourselves in our publicity materials. Should you not allow this, please notify sales@tgifbazaars.com via email. Please note that under the NEA licensing regulations, we will need to apply for Tradefair permit and provide a merchants list before we can operate the bazaar. As such we require scanned copies of your NRICs for submission to NEA,at least 1 month in advance. In the event that you are removed from any of our bazaars, if found to have breached any of the terms and conditions above, NO REFUNDS would be provided.